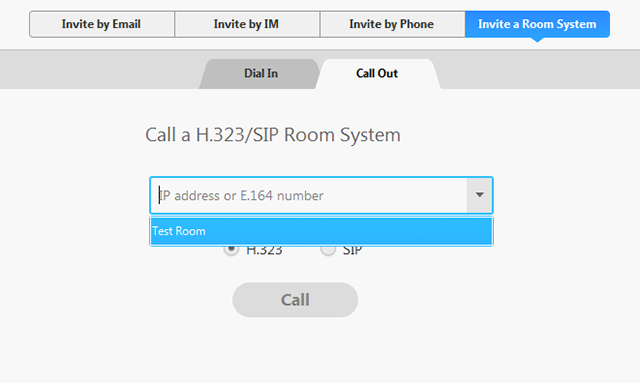 The H.323/SIP Room Connector call-out feature allows you to dial out to an H.323 or SIP room system from the Zoom Client using the public IP address or SIP URI assigned to the device. Zoom version 3.5 or higher is required to use the call-out feature. Start a Zoom meeting as a Pro user. Select Invite on the Zoom meeting toolbar. Select Invite a Room System. 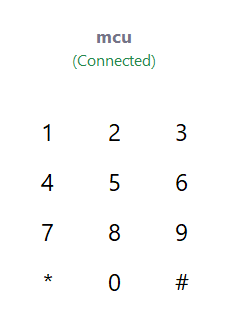 Click Show Keypad if you need to enter digits (e.g. meeting ID) during the call-out. Enter numbers using the pop-up keypad. The default call-out speed is 1920kbps (maximum). To set the call speed when using the Zoom call-out feature, you can enter the speed in to the dial string as seen in the below examples. 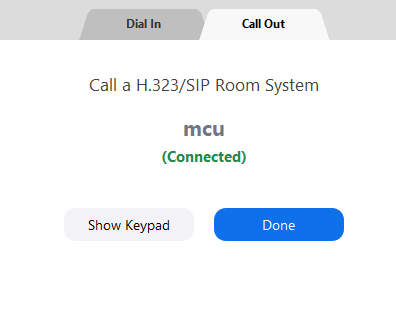 To send DTMF tones when connecting to a Gatekeeper, MCU, or other H.323/SIP hardware that requires a party number, conference number, or e.164 address, you can enter these in the Call-out dial string.